to get on the Altar Server Training waiting list. Need to get a substitute? who can serve for Water or Wine. 10:30 a.m. and 2:00 p.m.
Friday May 10, 2019 - 7:00 p.m.
Saturday May 11, 2019 - 2:00 p.m.
or would like to register your child for an upcoming training. Email Diane Martinez when you get a substitute. You will receive 1 point for responsibility. 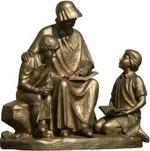 The next altar server schedule will be emailed on or before 4/24/2019.